One of the challenges of integrating technology into teaching and learning is understanding how to leverage tech tools to make an impact. One way to gain a deeper understanding of how technology enhances and transforms education is the SAMR model. 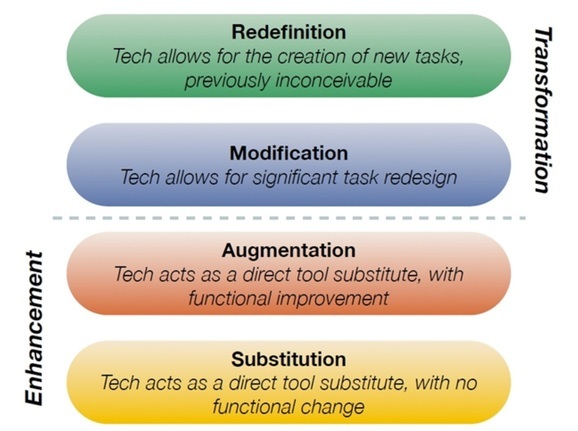 SAMR is an acronym that stands for substitution, augmentation, modification, and redefinition. This tool helps educators to reflect on their work and recognize the specific impact that technology has on teaching and learning. Teachers can use this model to help them "go above the line", changing their work by modifying or redefining through tech integration. Let's take a look at the SAMR Model in 120 seconds. Seeing the SAMR Model in action! Review the example below to see how technology can be used to redefine an assignment. Substitution: A Google Doc replaces pen/paper as a way for students to complete their writing. Augmentation: As a homework assignment students peer edit the writing using "Comments", providing feedback the student can use to write a final draft. The teacher provides corrections and feedback through "Comments" and a different color font, allowing the student to get speedy feedback on his/her work. Modification: An individual assignment becomes a group project in which multiple students can work in the same document from different locations, using Google Chat or Google Hangouts to continue their learning beyond the class and/or school day. Redefinition: A completed assignment can be published to a teacher's website where it can be posted as an exemplar; shared with parents, the community, and a global audience; and made available for comments through the blog's comment section. Click here for a resource with more SAMR examples. Let's take an opportunity to practice using technology to change teaching and learning. Spin the wheel to the right to choose an activity. Then, use the bank of tools below to substitute, augment, modify, and redefine! Review the tech integration tools from the list below and apply them to the task above in order to go above the line on the SAMR model.